Today was a really good day for Lookbook! I logged in and instantly saw this look and fell in love. Probably because I’m really into knee high socks and denim right now. This is a very simple look, but it is quite adorable. I love her Romwe Detachable Collar probably the most of all. I have a slight obsession with collars in my illustrations I’ve noticed. All of the children i’m illustrating for this book have some sort of adorable vintage inspired collar. Also a huge fan of satchel bags in general! 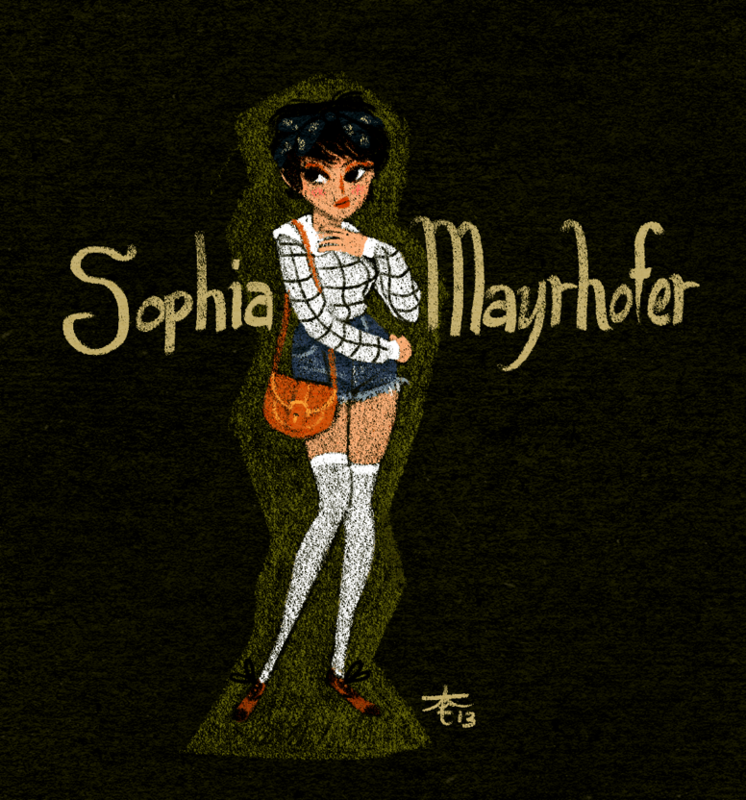 Sophia’s blog, A Lifetime of Memories is truly a breath of fresh air! She takes loads of photos of her travels and they’re all very tender. Each capturing a moment in time that feels almost voyeuristic in nature. Going through her blog you feel like you’re traveling along with her. Not only are her photos very well taken but they’re just very heartfelt and they make you smile. There aren’t many photos of people hamming it up for the camera and I love that quite a bit. i must apologize for not making a post last week!! I’m doing this children’s Illustration gig and it’s keeping me very busy. Unfortunately i cannot show any of the work i’m doing for this book (and omg it’s so cute) so my page has been pretty stagnant. 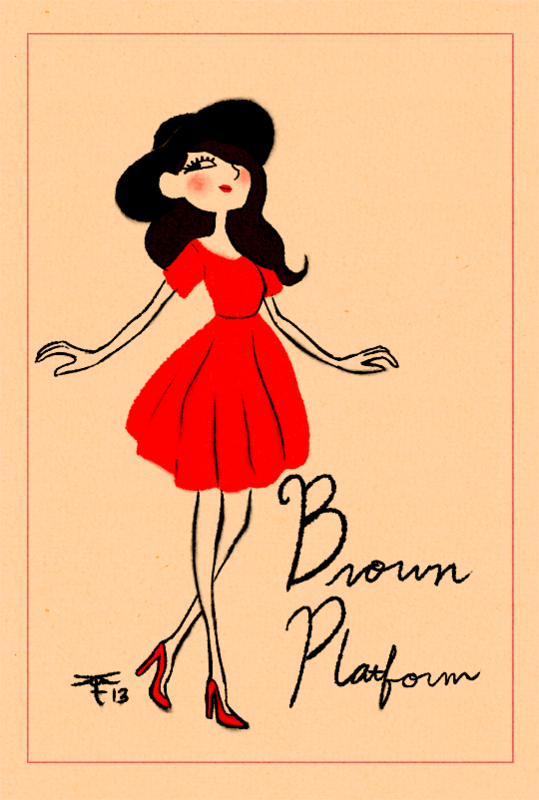 However-I thought I’d start doing illustrations in the style of the book I’m working on. 😀 Also, after making a huge announcement about animation, I’m starting to doubt that I’ll be able to keep up with that. So it’ll be animation AND Illustrations. I’ll do them when i can!! I am very new to the greatness that is Georgina Doull! I found her while sifting through lookbookers to draw and I was absolutely stunned by her looks. I feel like she is one of the most adorable things I’ve ever seen ever and I’m not even exaggerating. Clicking through her looks I find myself going “OMG THAT’S SO CUTE” like over and over again. I always love seeing girls who dont allow their size to get in the way of being fashionable and she’s an inspiration to me. 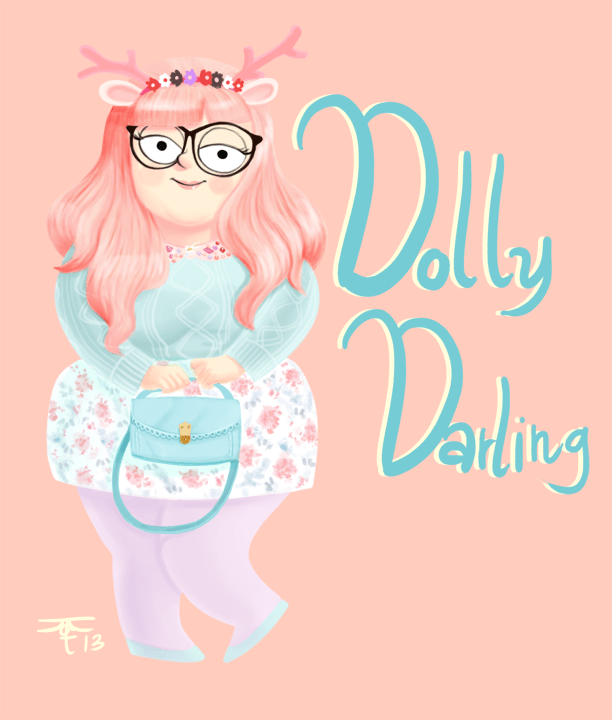 Going through her blog cupcake’s clothes i got lost in just how awesome and creative she is. She does these lovely illustrations of her dogs and makes theeeeeeeeeeeee most amazing jewelry ever. She also seems to share my love for adorably small things. I really liked this look because It’s so soft and whimsical. I love her pink hair and her reindeer headband is the cutest thing ever. I also really want to steal that bag. Georgina is amazing and I advise you to check her out if you haven’t already. via Tumblr http://lookbookillust.tumblr.com/post/42097650351/i-got-a-commission-from-nelia-of-www-styleblog-ca I got a commission from Nelia of http://www.styleblog.ca to illustrate her dream wardrobe! She sent me some of her runway favorites and I dressed her in them! 🙂 She wrote this absolutely lovely blog entry about me on her website Please check it out. I’m at the end of my commissions list and i’ll be very freed up soon so if you’re interested in a commission email me at kathrynwilkins@me.com ! I always see Haru’s (I thiiiiiiink that’s her name) looks when i’m browsing for people to draw! This is the first time I’ve actually gotten around to drawing her and I’m quite happy with the outcome! This look is just chalk full of little details that I adore. First of all, i loooove her koala socks. It’s very subtle but very adorable. I’ve always had a weakness for dyed denim as I used to dye denim all through highschool and I adore the pink denim jacket she’s wearing. Her floral crown is adorable as well. I feel like i haven’t seen very many of those crowns made with folded fabrics-very cool. Also, I have started to record my illustrations on LiveStream! 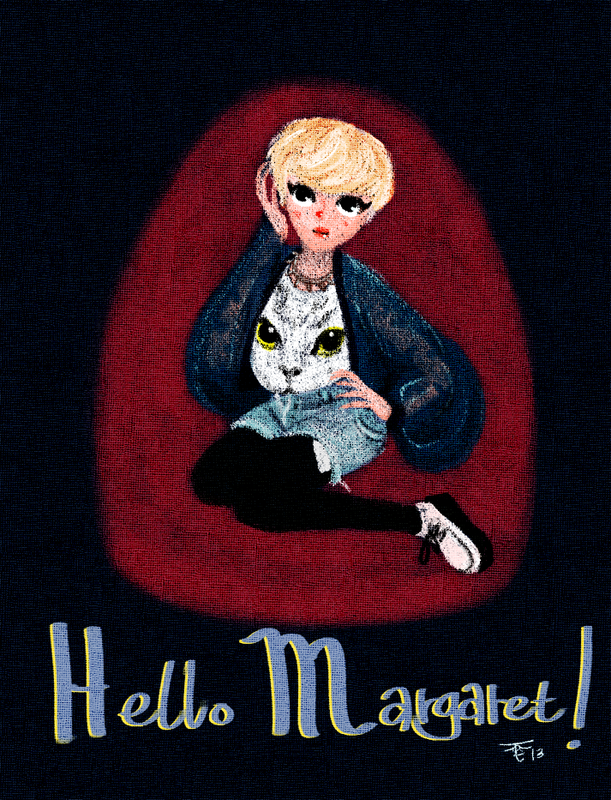 This is the very first LookbookIllust illustration to have been recorded ENTIRELY on Livestream. You can see it all here. There will be plenty of live stream recorded shows in the future so follow my twitter @KattyWilkins to get updated when i go live! Come in and watch Law and order or possibly kpop music videos with me while i paint. ahaha. I love this look, this dress is so adorable and beautifully constructed! I love the shape of the skirt…i want one! Anastasia Siantar is a blogger from Indonesia. Her style is cute, simple and subtle! 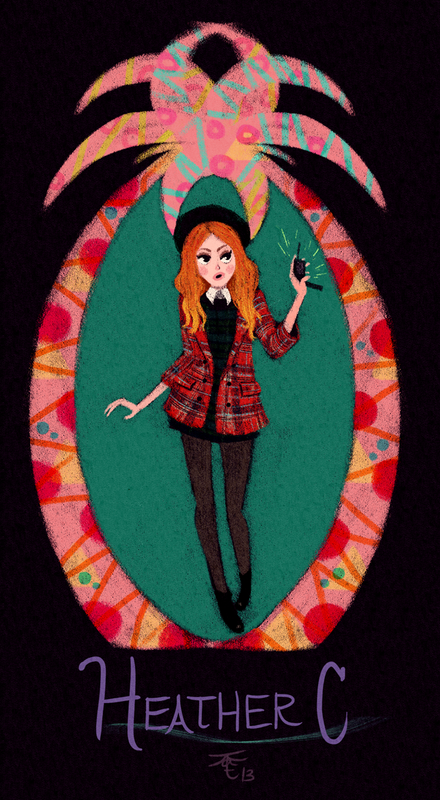 This is the 50th illustration for LookbookIllust! I want to thank everyone for following and supporting me! it means so much. I’ve gotten a lot of interesting opportunities that have come from my work on this blog and the bloggers I’ve illustrated. From the bottom of my heart THANK YOU. 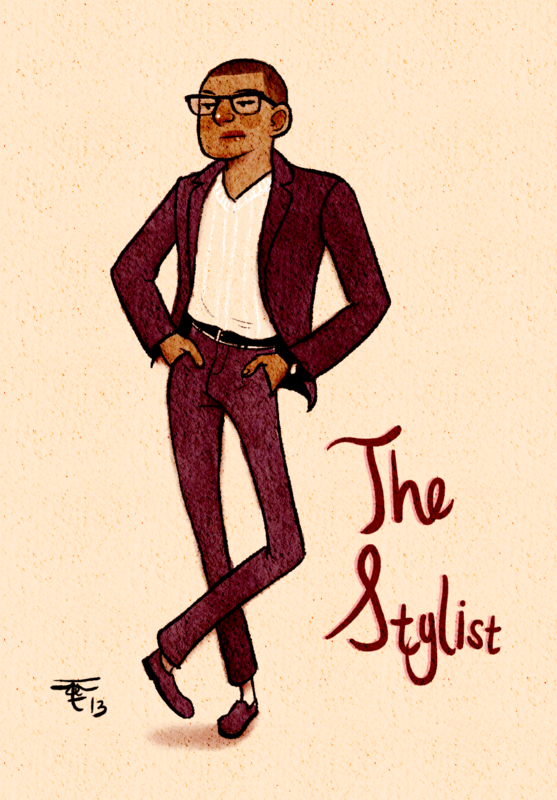 I dont think there’s anything that makes me swoon more than a well dressed man and Dejon Marquise defines that to a T. He has an impeccable style and he’s someone I can, without issue, add to my list of people who i could draw every look. He has such a classy, confident style that is colorful yet masculine. I’ve been wanting to do an illustration of him for quite some time but I never got around to it. He’s one of these people who uploads so many looks if I pick a look i want to illustration the day before I actually go for it, he’s got another one up and I can’t decide. Dejon is amazing and I can honestly say he’s never had an outfit I haven’t liked! I’m starting to notice a trend in the looks I choose for this project. It seems i pick either very colorful looks or looks that have a POP of color. When browsing through today’s men on Lookbook, I came upon Milan Boya! I haven’t seen him before but clearly I’ve been missing out! Milan has a very colorful and sensible style and he makes a great use of pattern and color. 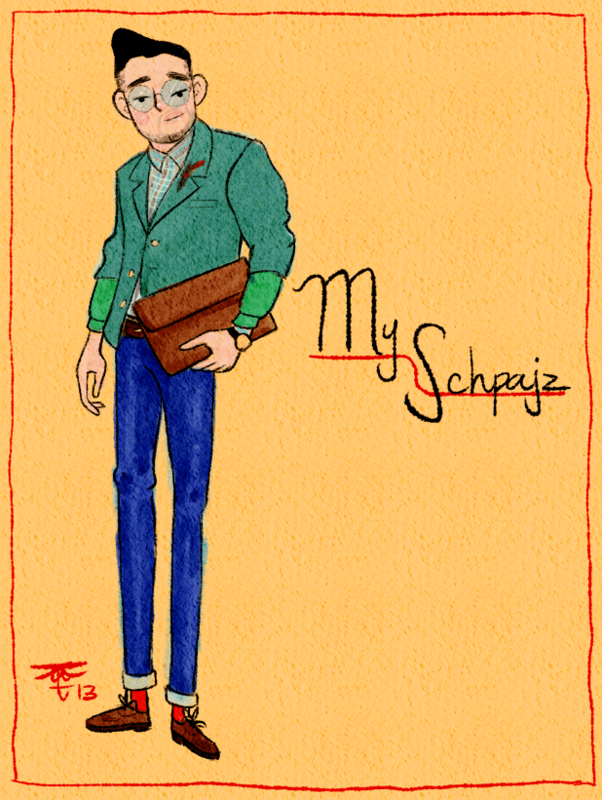 His personal fashion blog, My Schpajz, give a very pure and artistic view of his style. I’ve noticed he goes through phases in his styling. Currently he utilizes bright and boldly colored socks as an accent to his already colorful outfits and this is a detail that truly brings the outfit together. His blog is filled with gorgeously posed and composed photos of his photos and I can honestly say that there isn’t a one that i don’t like. He’s one of few lookbookers i’ve illustrated where I could forsee my self wanting to draw every single one of his looks! 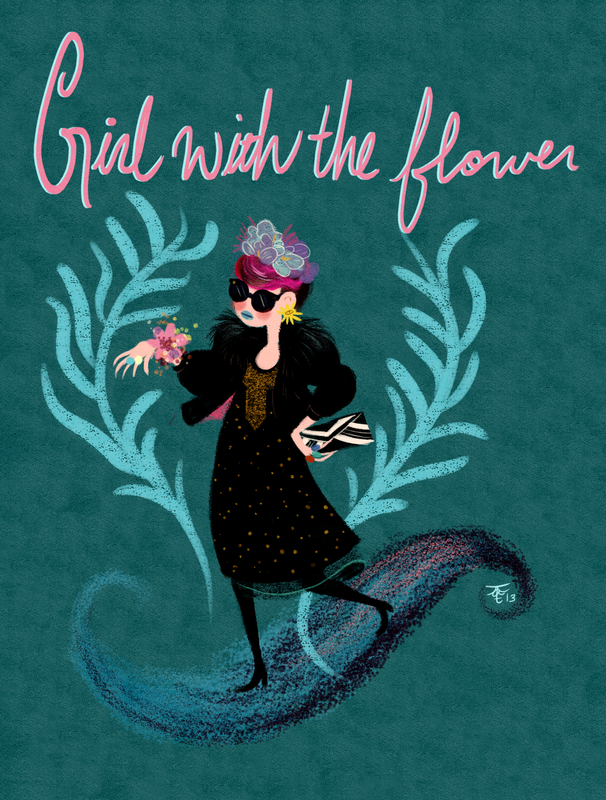 Zoe S of Girl with the flower! So, i’m at the start of a new approach on my LookbookIllust Blog and I thought Zoe would be the most perfect person to use for inspiration for exploring this style!! I have come across Zoe on several occasions and I have always adored her sense of color. She has just THE most perfect eye! It’s almost uncanny to me how well she pairs colors. I don’t say this about very many fashionistas but she is ICONIC. She pushes the envelope and takes risks and it always works; I think that’s what I love the most about her. She makes a lot of very bold decisions and I love people who aren’t afraid of going there! 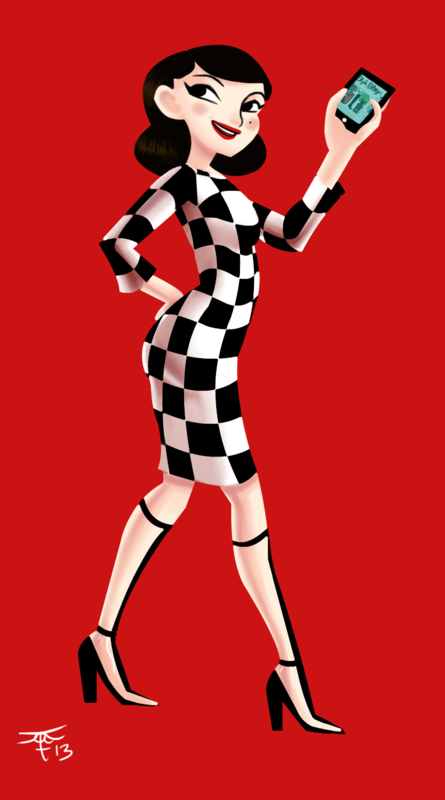 I can’t say this about a lot of people but she is frankly is someone who makes me want to draw ALL of her looks. She makes these absolutely amazing Head Pieces that are for sale in her Etsy Shop. I love her as an artist as as a DIYer. ❤ She’s definitely one of my to favorte girls on Lookbook!